Well, this is cool. The Baltimore Orioles have swept the favored Detroit Tigers to advance to the American League Championship Series. The Orioles will play either the Kansas City Royals or the Los Angeles a Angels, though right now it looks like the Royals, who are leading 5-1 in game three after winning the first two games in Anaheim could be on their way to sweeping the highly favored Angels in their division series. Personally I would rather see the Angels come back and win it simply because the Orioles have pretty much owned the a Angels this year and have had some pretty tough series against the Royals. Regardless of the outcome of the Angels and Royals series, the Orioles are just four wins away from advancing to the World Series since 1983. Regardless of who they have to play I think that they have a great chance. Congratulations to the Orioles and the young players that I have gotten to know in their minor league careers in Norfolk, Chris Tillman, Zack Britton and Kevin Gausman. This is really pretty cool. I have believed in this team ever since Buck Showalter was hired as the manager and Dan Douquette as the General Manager. One only has to go through my website and look back at what I wrote back in 2011 and early 2012 about the Orioles to verify this. 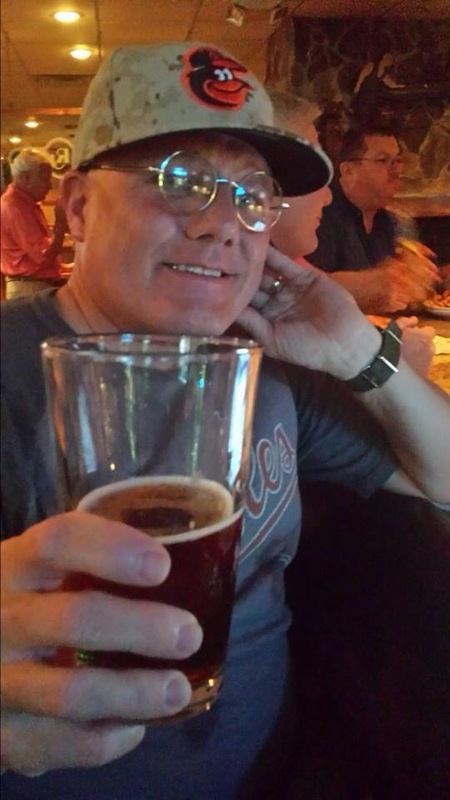 My hope is that tomorrow the Giants will finish off the Nationals and that both the Orioles and Giants will advance to the World Series regardless of who they have to play in their respective League Championship Series later in the week. Have a great night and may your Monday be better than most Mondays. 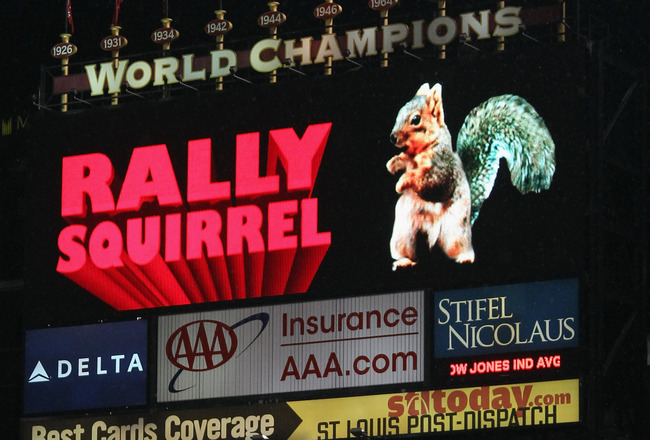 Baseball people are tremendously superstitious. Sometimes events, miscues, injuries bad calls and bad luck are of more significance than they would be if they didn’t happen when they did. Cubs fans can attest to this as can the generations of Red Sox, White Sox and Giants fans who endured one shocking disappointment after another as they languished between World Series Championships. Derek Jeter is the face of the Yankees. 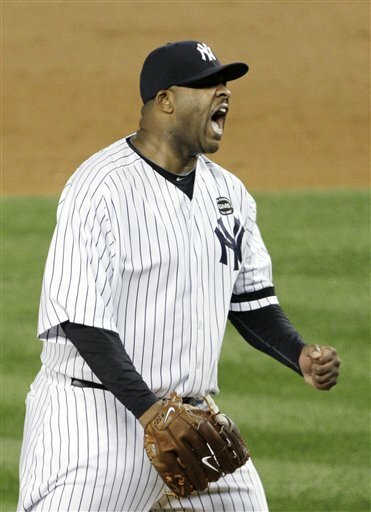 He has been a staple of the team and been their as they won championship after championship and his steady play and leadership have been a part of the great success enjoyed by the Yankees. He has played through injuries and never missed a post season game until tonight. 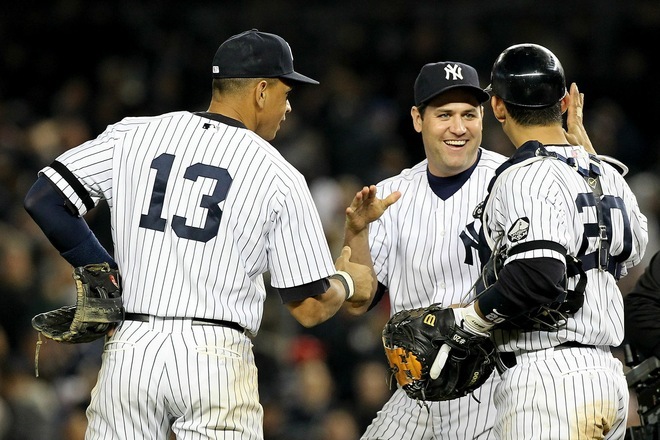 The Yankees may have become the latest team to see things slip away and legends pass. In the space of less than a day the New York Yankees went from looking like they would pull off another late game miracle thanks to the clutch hitting of Raul Ibanez to being down two games to none in the ALCS. On Saturday the Detroit Tigers appeared to be sailing to an easy win when the Yankees got to closer Jose Valverde in the bottom of the 9th. Up 4-0 the Yankees scored 4 runs including a game tying 2 run home run by veteran Raul Ibanez who seems to have made hitting dramatic late game home runs a new habit. But in the top of the 12th inning, as the Tigers rallied for what would be a winning lead, Derek Jeter, “The Captain” who had played in spite of injury for much of the past month broke his ankle on a freak play attempting to field a ground ball. 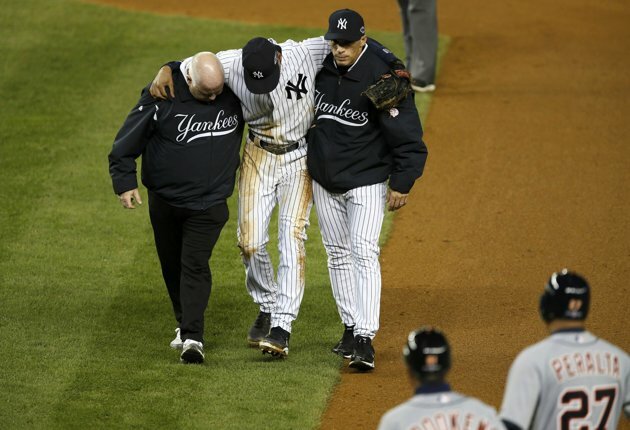 It was a devastating loss for the Yankees, not so much the game but Jeter’s injury. Jeter was one of the few Yankee regulars beside Ichiro Suzuki who have had any offensive punch during the post season. 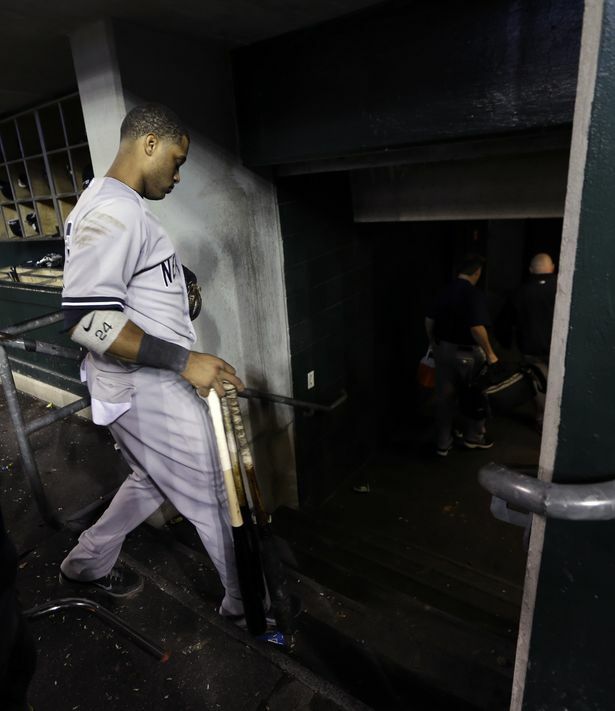 Alex Rodriguez, Nick Swisher, Curtiss Granderson and Robinson Cano have had nightmarish post-seasons. 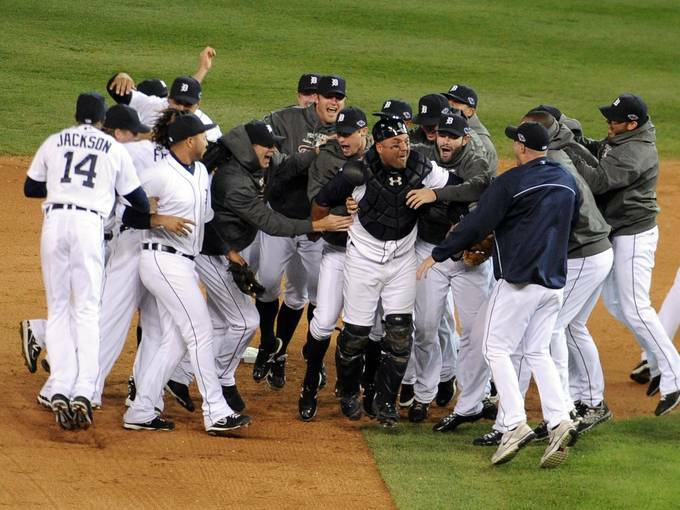 The Tigers won game one 6-4 and shut out the Yankees 3-0 today to take the 2 game lead in the series. The Tigers were leading 1-0 in the 8th when they benefited from a blown call at second base when Nick Swisher threw behind Omar Infante who gone too far off the base. Cano applied the tag but Infante was called safe. Yankees Manager Joe Girardi argued the call twice and was thrown out of the game. Girardi can shift blame to the umpires all that he wants but the fact is his team has not hit the ball during the post season with the exception of the 9th inning of game one against the Orioles. The Orioles had a bad call that negated a home run in game 5 of the Division Series against the Yankees that easily could have changed the course of the game, and may have help the Orioles win the series. To see Girardi complaining tonight in the post game interview was unbecoming, especially compared to Buck Showlater’s response to similar questions after game 5 of the ALDS against the Yankees. Now the series moves on to Detroit and the Yankees will have to face Justin Verlander. Unless the high priced Yankees offense can get going and start getting hits and producing runs they will not play another game at home this year. The Yankees were lucky to get through against the Orioles and unless something changes fast they will exit the post-season. I think that this may actually point to greater problems next year for the Yankees. They are getting old and despite their seemingly unlimited ability to buy what they need on the free agent market are not the team that they used to be. They still have a lot of talent but something is not right in the team chemistry and Joe Girardi will have to figure that out in the next few games and after the season ends. I think that Jeter’s injury and the Yankees struggles portend the changing of the guard in the AL East. 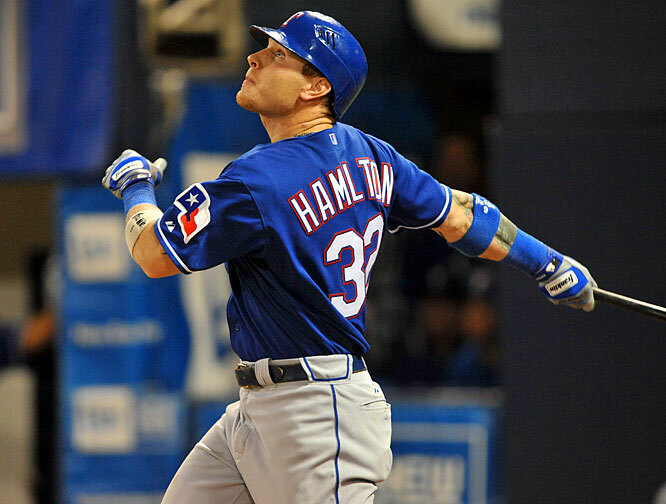 The Texas Rangers defeated the New York Yankees on Friday night in Arlington Texas. I have to say up front that I predicted the Yankees to win this series in 6 or 7 games not because of any lack of respect for the Rangers who I actually believed to be the better team but because of how well the Yankees played in the 2009 post season especially against the Angels in the ALCS when the Angels had dominated the Yankees in the regular season. That being said my first playoff prediction of this season has gone down the tubes but it really doesn’t bother me because in my heart I was pulling for the Rangers to take the American League and the World Series if the Phillies come back against the Giants this weekend to take the NL Pennant. If the Giants win the Pennant of course I will be cheering them on but I will analyze the hell out of the series and make my predictions accordingly. 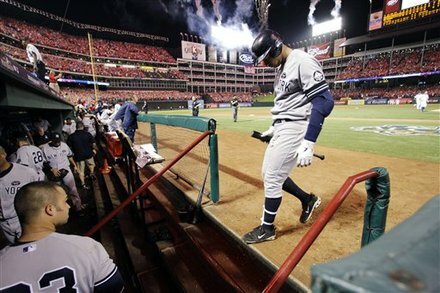 The Yankees rolled into Arlington having escaped elimination at the “house that George built” on Wednesday night. 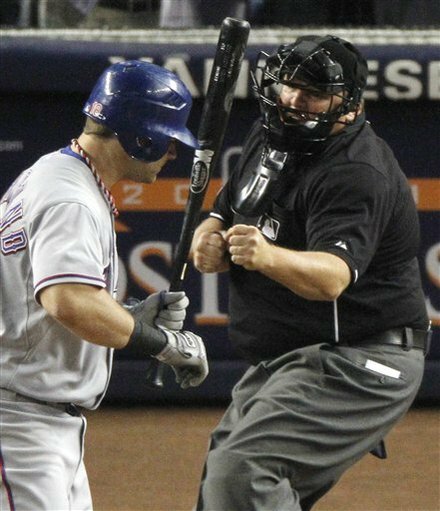 The Rangers set the tone early against Yankees starter Phil Hughes with Elvis Andrus slamming a leadoff double and scoring on a sacrifice ground ball by Vladimir Guerrero. The score remained 1-0 until the 5th inning as both Hughes and Rangers’ starter Colby Lewis shut down the opposing lineups. The Yankees scored in the top of the 5th when Alex Rodriguez doubled to lead off the inning advanced to third on a sacrifice fly and scored on a wild pitch which actually hit Nick Swisher. This was yet another badly blown call by an umpiring crew that leads me to scream at the top of my lungs for an increased use of replay and an “eye in the sky” umpire as part of the umpiring crew, but I digress, I will cover replay after the World Series. The Rangers opened things up in the bottom of the 5th scoring 4 runs against the now hapless Hughes and reliever David Robertson. Mitch Moreland singled and then advanced to third on consecutive ground outs. 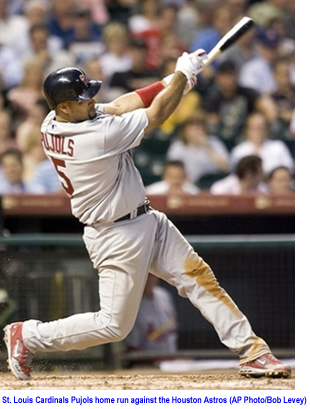 Hughes then intentionally walked Josh Hamilton to get to Vladimir Guerrero. Guerrero gave Hughes a fine “how do you do” tattooing a double to deep center which scored both runners. That was the end for Hughes as he was relieved by Robertson. Nelson Cruz welcomed Robertson back to Texas slamming a home run to deep center. The Rangers added an insurance run in the bottom of the 7th as Michael Young doubled to lead off the inning and scored on a sacrifice fly by Ian Kinsler. That was the last Yankees’ run of the season, Lewis shut the vaunted Yankee’s lineup down through eight innings and Neftali Felix put the Yankees down in order in the 9th fittingly striking out Alex Rodriguez looking. 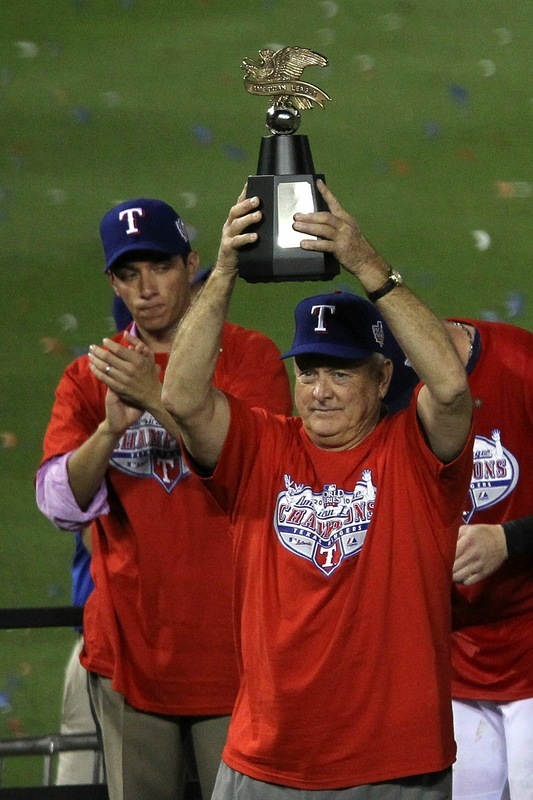 The Rangers won the American League Pennant downing arguably the two best teams in the League to do it. 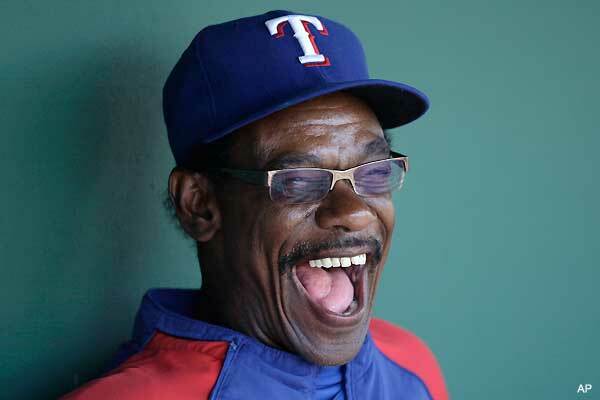 The team which has bonded through great difficulty with ownership issues, as well as addiction and substance abuse issues involving both Hamilton and Manager Ron Washington. Instead of ostracizing either the team supported them both something that does not always happen. The Rangers now go to their first World Series in franchise history to face either the San Francisco Giants or Philadelphia Phillies. One now has to wonder about the Yankees. 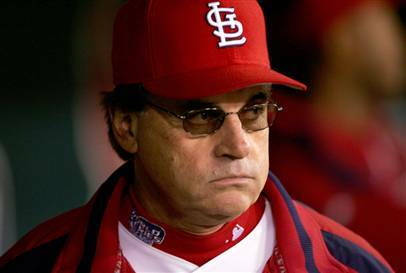 They are showing their age and their starting pitching staff is not what it was. Their middle relievers are weak in comparison to many other teams and these weaknesses across to board were shown in gory detail in the ALCS. The Rangers scored 38 runs on 63 hits and hit .304 against Yankees pitching while the Yankees scored only 19 runs on 38 hits with a .201 average. 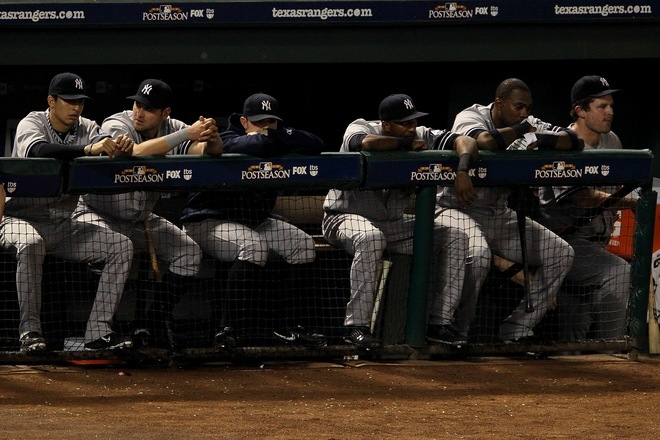 In team pitching the Rangers had a 3.06 ERA against the Yankees while the Yankees staff had a 6.58 team ERA. Though the Yankees won two games the series was not close or even competitive. The Yankees will need to retool in a big way in the off season because the Red Sox and the Orioles will be after them as the Rays try to recover after their coming salary cuts and loss of key players. The Yankees need to figure out what they are going to do with their pitching staff as well as their bloated and non-productive lineup.